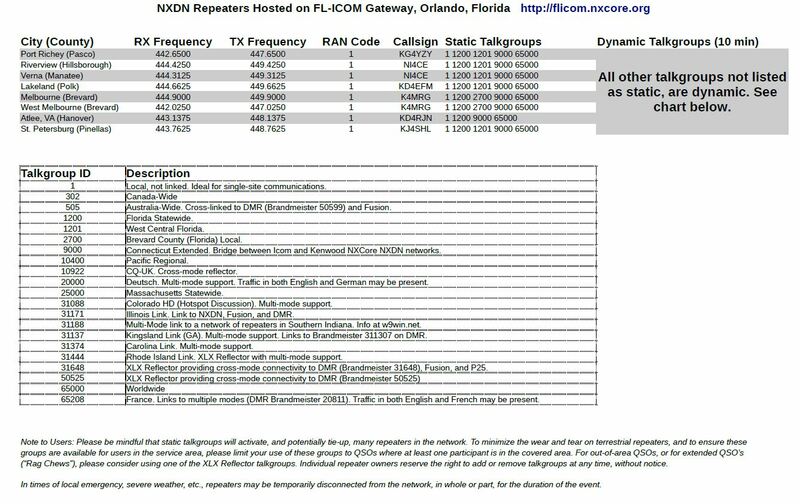 Here is the current list of repeaters and talkgroups, served by the Florida NXCore server. nxdnrepeaters <– PDF file for downloading. If you’re accessing the network through one of the repeaters in this list, you only need to make sure you have a memory channel programmed for each talkgroup you want to use. Optionally, some radios allow you to select a talkgroup from a list, without needing a separate channel. Consult the user’s manual for your radio for specific instructions. All dynamic groups are on a five-minute timer. Every time you key the radio on your desired talkgroup, the timer automatically resets. This document may be freely shared wherever its information may be useful. Here is a list of viewable dashboards for the NXDN WW Network. Thanks to Adrian, VK4TUX for putting this together. DMR USE WITH A HOTSPOT WHATEVER…. PLEASE SHARE ON FB, PI-STAR, WHATCHAMACALIT, where ever there is use of the kenwoods with DMR hotspots. Thanks. attempts to raise w2bui have failed. Unknown if he is a silent key or not. No one can confirm. Also my name is Evans, not the minion Kevin. 2 Kenwood DMR with Dual Slot Direct Mode (the latest of most DMR releases) DOES NOT WORK WITH ANY HOT-SPOTS IN SIMPLEX MODE. Do not use it until the creators find a way to incorporate it Into the software. TURN IT OFF. This reverts to the old style of single time slot use. Until further notice. It is with great sadness to inform our membership that OARC Director Ralph Betts W4ORL has become a Silent Key. Ralph contributed to OARC in a number of ways other than being a Director and he will be truly missed. This is sudden and a total shock to all those who have known Ralph for years. We do not have any details of how Ralph passed. We will not speculate on the cause and will wait for any official cause to be announced by the family. In the meantime, please keep Ralph’s family in your thoughts and prayers. the site is http://nxmanager.net If you scroll to the bottom of the page, you will find a block where you enter your information in at. 1 Please use CAPS to enter your information into the database. 2 There are only 65519 UID’s that NXDN technology USES unlike DMR. UNLESS it is above 65519, then you will need to use another numeric. This is not my rule or evil way of doing things, this is how the CAI of NXDN is laid out. SO, please, kindly keep it within the parameters of 1 to 65519, and even though you CAN enter your full DMR ID, the new database that will be put together forthcoming, will be used to parse your information for the DASHBOARD logs. Once we have a newer database built, tested and ready for prime use, Bill N2WNS or one of the other admins will chime in and let you know. I will add this to the Side Links area also. What is all this buzz about MMDVM and NXDN and ???????? other homebrew kits that are joining the Digital Ham Radio Era? Well, like most forms of digital technology comes advancement of it. In this case it came from Jonathan Naylor G4KLX and his project for D-Star, Fusion and P25 (aka P25NX). But for some of you, you already know what it is and does. For others, it’s where you can take micro-computing to the next communications level, and have a “repeater controller” doing all the hard work with simple radio gear, and OR a hotspot 2-way now. “I have merged he NXDN branch for both the modem firmware and the host into master. This means that the default version of the code is now NXDN enabled. It has basic networking built-in, talking to the single MMDVM NXDN reflector. I posted details of how to use it a couple of weeks ago. I am working on making the software compatible with the official NXDN amateur network, and in due course, that, along with some form of gateway will be released. At that time the MMDVM NXDN reflector will be retired. Please note that the extra processing load of the NXDN code means that it isn’t possible to run five modes on an Arduino Due. Aside from NXDN, D-Star and DMR are the next heaviest protocols for processing, so it may be possible to run (say) NXDN and P25 on a Due, and maybe more. The more powerful STM32 and Teensy based systems can easily run all five modes. I believe firmware for the ZUMSpot and MMDVM_HS boards will also be available soon. In unrelated news. I’ve been adding FCS support into the YSF Gateway and taking the opportunity to clean the code up also. I did a first test this evening trying to log into FCS001-20 but with no success 🙁 It’s early days though. So with that being said, the next level of NXDN and the Homebrew world is network linking, which is still being tested at this time, though the MMDVM network has a function for linking, it is not currently connected to the NXCore 65000 relm at this time. I will let you know when that chapter comes into play, but do expect to see a SURGE of new users to say hello to! I have a note from Johnathan about his project. See Below!! I converted the MMDVM NXDN implementation over to very-narrow mode, aka NXDN 4800. I decided not to make it switchable to NXDN 9600 as it would then mean that people could choose to make their systems incompatible with existing networks. So NXDN 4800 it is. It’s all been checked into GitHub for both the MMDVMHost and MMDVM firmware under the nxdn branch. Currently it’ll be an RF only repeater, but it will allow you to play. I intend to get a simple NXDN reflector active and make a simple NXDN parrot available too. This will allow basic testing and communication until we can do something better. There is a bug in the display code, maybe Nextion only, where the screen doesn’t update correctly at the end of a transmission, and I can’t find it! So any takers to look at that would be appreciated. I’ve asked Andy CA6JAU to review my new filters for NXDN 4800 to make sure that they’re correct and that I have transmit amplitude (deviation) correct also. Even if they aren’t, you can try installing it and talking to yourself. Greetings all. Spent the better part of 1-28-18 merging and updating the spreedsheet for the UID lists. Right now I have some 403 listings that are confirmed and valid. Please be sure to use the NXMANAGER.NET site, scroll to the bottom and enter your information into the database. I have pulled the link to the GOOGLE DRIVE sheet I had been using, and merged out all the dup’s and added the missing ones to it. I will N2WNS and make sure we have the database up to date and I will also work on getting it linked to our stuff here as well. Please welcome Alex, KD6VPH in Tumwater, WA to the network. More details to follow as he builds out his Kenwood system. More details to follow as they become available. Icom Setup Guide – Ext. Link Guide for Icom Repeater Owners to setting up their system on the NXREF Network, from the Northeast Corridor group. http://dietsecrettips12345.org on Updated listing of currently connected sites.